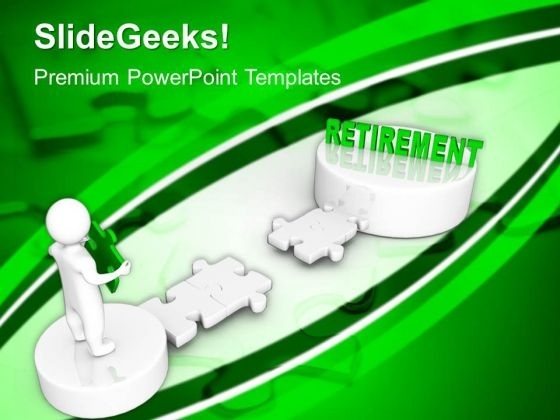 3d Man With Word Retirement Business PowerPoint Templates And PowerPoint Themes 1012-Develop competitive advantage with our above template which contains a diagram of path to retirement. This image has been professionally designed to emphasize the concept of pension plan. Our attractive image makes your presentations professional showing that you care about even the smallest details. The ideas and plans are on your finger tips. Now imprint them on the minds of your audience via our slides-3d Man With Word Retirement Business PowerPoint Templates And PowerPoint Themes 1012-This PowerPoint template can be used for presentations relating to-"Man with puzzle retirement, business, puzzles or jigsaws, people, finance, marketing" Plan your excavation with our 3d Man With Word Retirement Business PowerPoint Templates And PowerPoint Themes 1012. Apprise your audience layer by layer. Your ideas deserve more exposure. Our 3d Man With Word Retirement Business PowerPoint Templates And PowerPoint Themes 1012 will ensure due coverage.